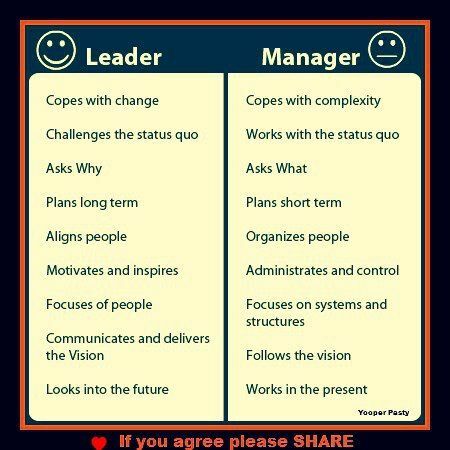 Are leadership and management alien concepts? Can one really exist without the other? While people tend to put leadership on a pedestal, management is often given short thrift. Since most people in the world have to deal or participate in the world of management, it is important to know how to discharge both functions equally well. When you think of it, even the word micromanaging is casting aspersions at managers. Is there such an equivalent for leaders? This graphic is just one of many like it floating around the internet would suggest Let’s discuss how each of these comparisons holds up to some scrutiny. These days, changes often come with complexity. Is there really a reason why someone should be looked down upon for wading into complex issues? There are times to work with the status quo, and there are times to challenge it. Some cultures do not tolerate challenges to the status quo, and coming at it full frontal may mean the end before you even have a chance to make a difference. It is better to suggest that you work with the status quo, and look for opportunities to change it. Challenging it without basis is unwise. Measures are important. If it were not so, leaders would not be so dependent on metrics. How else would you demonstrate improvements from one timeframe to the next? How many times have you heard someone talk about the future, but in the short-term, there are no steps that are designed to lead you there? You only have to listen to people who have worked for bad managers to understand how organizing people are important. Without organization, people become angry that their efforts and their time are frittered away. There is no question that people perform at their best when their internal motivation also gets an external boost. However, inspiration without a system to make things happen is a pipe dream. See the previous point about systems. Here’s a test: if leaders focused more on people, and did not care so much for systems and structures, telecommuting, and flexible work schedules would be a lot more common. What is the purpose of creating a vision, when there is no one to follow? Is a leader without followers truly a leader? Daydreaming may have its place, but without daily commitment to the goal, you will end up with the dreaded status quo. Granted that the pejorative term “middle management” conjures up visions of a dysfunctional place reminiscent of “Office Space.” However, proper leadership is necessary in order for management support to function, and achieve the goals to which both sides are committed.